Bangalore: Students of Trio World School ICSE raised their voice against injustice towards children through a street play “Raise your Voice” “Stop Child Labour”. The play organized at Orion Mall, was a social awareness program that hoped to create awareness for the general public, enable everyone to know their rights and empower as many as they can against the social injustice of child labour. India is sadly home to the largest number of child labourers in the world and it would be difficult to state and notice that social justice is missing in today’s world. Not everyone in the society receive equal access to resources and opportunities, such as a simple roof over their head or a basic education, and this is due to the injustices that prevails all around us till date. Hence, many children even today grow with no stability and are subjected to doing hard labour even at their tender age. Like the state of Punjab which today has ended all forms of child labour. Punjab has pledged that every deserving child will go to school and attain the necessary basic education. Such is the wish of the students of Trio to bring more awareness by raising their voices. Taking the theatric route and creating awareness on child labour aiming to eradicate it. “Child labour is no simple term. It refuses children of their constitutional right to education. As a school, we are aware of how education is an important aspect in a child’s life for its cognitive development. The play was an attempt by Trio to emphasize on the truth that this social evil needs to be stopped completely. 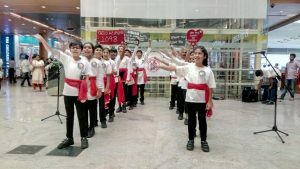 This initiative, witnessed by hundreds, was taken by the school to bring adequate awareness to the people and our students have made us proud in an eye opening performance.” said Mr. Naveen KM, Managing Director Trio World Academy.